Source Code fits in the same class of film as Inception and Children of Men: the subgenre of ‘sci-fi action thriller for adults.’ It’s a rare breed, and even rarer still when it’s good. Sadly, Source Code isn’t as good as either of the other two films I mentioned, but it’s a solid entry in the genre. The film follows the character of Captain Colter Stevens (Jake Gyllenhall) as he repeatedly attempts to discover a bomber on a train, 8 minutes before the bomb goes off and kills everyone onboard. How does he do this? Though something called “Source Code,” which uses a combination of the reconstructed memory from one of the train’s passengers and quantum mechanics to access alternate realities very close to the originating reality. What grounds this far out plot is Colter’s human relationships. Firstly, that with fellow passenger Christina (Michelle Monaghan), who is a friend of school teacher Sean Fentress, the passenger whose body/memory Colter is using. Over the course of his repeated attempts, he begins to fall for her. Secondly, his relationship with his father (voiced by Scott Bakula, in a sweet Quantum Leap wink), and thirdly with his handler, Captain Goodwin (Vera Farmiga). All of these relationships take precedent over the terrorist situation. Bolstered by the acting and directing, I think this is a smart choice that elevated this film beyond something like Battle: Los Angeles. My main reason for seeing this film was its director, Duncan Jones, who directed the best science fiction film of 2009, Moon. While this is not his script, having read/seen interviews with him commenting on Source Code, it is evident that he worked hard to put his stamp on the material, and improve it where appropriate. Having seen both films, it is easy to imagine why Jake Gyllenhaal and the producers were keen to bring Jones on as the director. Both sci-fi films have a similar one man vs. authority vibe to them, as well as a restricted number of locations, but obviously the difference in pace and scope is huge. The short review is that I highly recommend this film, especially if you like films that are a lot of fun to watch, but also get morally/philosophically deeper the more you think about them, not unlike Boiler Room or Stranger Than Fiction. Warning: The rest of this review contains spoilers! One of the huge stamps Duncan Jones put on the film is the ending, which I’ll get to in a moment. Other minor things are the reveal about the way that Colter communicates with Goodwin and Source Code project director Dr. Rutledge (Jeffrey Wright). While the audience/Colter have been informed that the ‘capsule’ he is in is a construct of his mind, we are still pretty much under the impression that he is communicating with them via camera, just as we see his video monitors in the capsule, and their webcams. Late in the film, it is revealed that his verbal thoughts are actually just coming over as text. Saving this reveal until late really heightens the emotional impact, as it snaps to mind just how bad Colter’s situation is, and helps to prepare the audience for the final reveal of what has happened to him in the main reality. Along that line as well, this is one of the few films to date that does a good job of incorporating current technology into the plot. Many times while watching films now, I think to myself ‘How could these characters not be able to figure this out? I would have just Googled it on my phone by now!’ Source Code gives us mobile internet integrated into the plot, and doesn’t just provide us with a line of dialogue to cover up a plot hole. AVC: You did something unusual after the screening, where you asked the audience if they understood the ending of the movie, and then you offered your own quite in-depth explanation of what’s going on in the last scene. DJ: It’s good for me to know whether it works for people, because it was a hang-up I had with the original romantic ending, and I couldn’t let it go. The ending that we have is because I insisted. I just felt that this is a question too far that we leave at the end here. I really want to have at least something addressed and this is one of the things I wanted to deal with. I think it’s all very well to leave it on a romantic note, but there’s so many questions left and if you leave it purely as a romantic ending, it’s as if none of that matters, and it does matter and that’s what makes the premise interesting. So at least let me remind the audience that the repercussions of his actions are that there is another Colter Stevens now alive who doesn’t get sent on the mission. So this film does end up bringing in some interesting moral dilemmas here, and the way I look at it, Colter Stevens is probably at least guilty of manslaughter, which is an interesting direction for the film to take ultimately, and one I wasn’t really conscious of until the day after I watched the film. However, I do want to point out some things that hold this movie back from being great. One, Jeffrey Wright’s performance is so over the top, it’s almost distracting. I mean, it’s kind of awesome, because he pretty much plays the character through force of will. I also wished they had fleshed out Vera Farmiga’s Captain Goodwin more, to expand on her motivation for her actions late in the film. My final critique is that I wish the mystery of the bomber’s identity had as many twists and turns as the mystery of Colter’s situation with Source Code, as I feel the film points to the bomber from the get go. However, all of these were only minor tarnishes on the film in my opinion. I want to watch the film again, mostly to try to see if it’s Colter or Sean’s reflection on Cloud Gate. 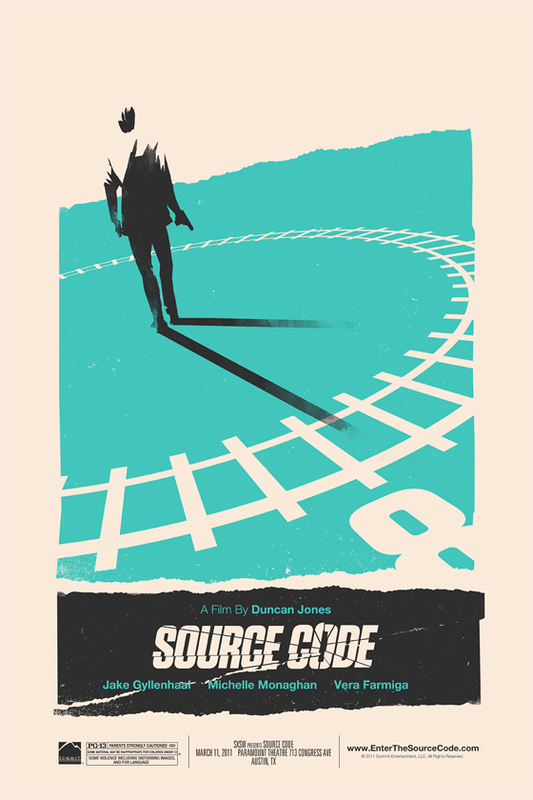 If you’ve seen Source Code, what did you think (especially about the ending)? This entry was posted in Movie Reviews, Uncategorized by Ryan Silberstein. Bookmark the permalink.